After eight months of studying in this online school, I decided to cancel my subscription. It is a good time to make a review about studying there, describing pros and cons of being a student in that school. The pros of studying in the school is a very low tuition, about 30$ in a month for an unlimited access. studying by yourself using multimedia with a possibility to synchronize it and work offline on iPad and probably on the other devices. Monthly subscription includes 30 group classes duration 45 minutes. The courses divided for levels from Beginners to Upper Intermediate. The topic changes once a day. Students can attend classes more than once a day but it doesn't make sense because of the topic of the day doesn't change. Participating in the classes possible trough Acrobat Connection. This application works with standard internet browsers (Goggle Chrome, Safari etc) and on iPad using Apple store app). The sound's quality in Acrobat Connection is worse than in Skype or G+hangouts but it is acceptable. "Rising hand" is a feature of Acrobat Connections which is widely used during the classes. Most of the teachers from the USA, the UK, South Africa. A usual number of students is four or five. The class dedicates to the definite topic and presents on the slides. Discussing of each slide from the presentation. Role play when two students speak each other according to the task displayed on the screen. After the class teachers write feedback and score your participation of the class. I think that it is forbidden to criticize students. Usual the two best students are mentioned by the teacher in a very positive light. It was a pleasure for me to see my name in feedback. There is a ticket for the fluency test with a teacher, it includes in subscription one time in a month. The part of the site "Community" doesn't work well. It is difficult to find a language partner and no good way for communication. I appreciated very much the possibility of studying by myself without the internet connection on my iPad. The class material for self-studying prepared very well, it includes video, reading exercises, a grammar section, virtual conversation using voice recognition feature. The material divided for a few levels from beginner to upper advanced. I was really impressed by the very large size of this digital book. 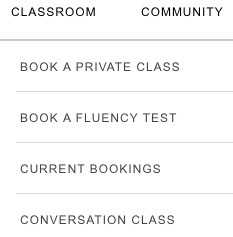 Each of 16 courses consists five classes. It needed several months for me to go from upper-intermediate level to upper-advance, even though I studied hard. The decision of leaving this online school came to my mind when the topics of classes became repeated even not the second but the third or fourth time. The fact that the school does not change the topics, but just repeats them every month. Next reason was that I found another school which offered not expensive private classes. When I decided to cancel my subscription I found that there is no button on the site for doing it. Monthly payments commit automatically from your bank card. Canceling subscription is possible only after applying to the school through trough the special chat. This chat includes the titles like complaining about technical problems, about teachers, class material and for subscription cancellation. I chose the last one and sent my request and started to wait. I waited two days during the weekend, nothing happened. I sent the second request, after that the third and so on. After several attempts of applying for canceling a subscription, I decided to phone them. But it wasn't possible because their phone number wasn't answered. Only after I posted help applying on their Facebook and G+ pages, after I wrote my requests on all titles of the site's chat, my subscription was canceled. I think the process of interrupting subscription was long because of absent at working place the definite employee who didn't open chat with requests for canceling the subscription. Some thoughts about protection your money. I asked my bank if I can ban auto payment from my card for this company. They answered - No, only one way is to change the card. It is very possible that someone has suffered from the fact that the company knowing his bank account details, relieves with your bank card money. And no way to file a lawsuit in the court, because we don't know the legal address of the company. Nevertheless, my conclusion about the learning process in EF-English live is a very positive. All teachers are true professionals, quality of the class material is very high. I would recommend this school for other people who are looking for serious online English school with reasonable prices.